If you have been arrested for DUI or for refusing a breath test, let Kramer Law help you today. We offer a free consultation and can get to work on your defense as soon as you let us start. An experienced Orlando DUI attorney at our firm will take the necessary steps to prevent any defective evidence against our clients from ever entering a courtroom. A Florida Breathalyzer test (or “breath test”) may be the first chemical test a Florida officer requests a driver take after suspicion of DUI. A driver who takes this test could be wrongfully arrested for DUI because of several normal factors that could influence accuracy. It is highly possible that a DUI charge based heavily on a breath test result can be reduced to a lesser charge or thrown out altogether. A breath test is one of three chemical tests that Florida officers use to measure a driver’s blood alcohol concentration (BAC). The legal BAC in Florida is .08. If your BAC is higher than .08 based on a breath test, you will likely be arrested for DUI and have your license suspended immediately. Besides human error, factors like the driver’s stature or health, how much is blown, radio frequency, or even dental work can affect a breath test’s results. A DUI lawyer at Kramer Law can help you legally challenge a breath test based on your unique circumstances. A Florida law enforcement officer administers a Breathalyzer by asking a driver to blow into an 8000 series intoxilyzer machine. An infrared light attempts to measure the volume of the air blown into the instrument based on the amount of light that gets through the chamber to the detector. There have been a series of flaws reported about the Intoxilyzer 8000’s flow sensor and other elements. In addition, these machines are not always calibrated and maintained on a regular basis as Florida law says they should be, which could result in a highly inaccurate reading. A 20-minute observation is required prior to the test. In some cases, an office may have failed to observe a driver for the set amount of time. This information could be used as part of a defense. 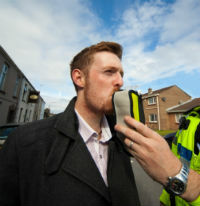 Do not just accept a DUI conviction if you have failed a breath test. Kramer Law DUI attorneys are not afraid to go up against scientific evidence like breath test results. We know the inner workings of the justice system and we use our years of professional experience for the best possible outcome. Call us as soon as possible at 855-Kramer-Now (855-572-6376). According to Florida’s implied consent law, every person with a valid Florida driver’s license has technically already consented to chemical testing if he or she is stopped for suspicion of DUI. If you refuse or fail a Florida breath test in the Orlando area, an experienced Kramer Law DUI attorney will know what the best next step will be to get you out of jail and back driving. Contact Kramer Law today.